Hey everyone itzBolt here, I’ve been a bit busy, but here’s the next batch of cards I will be looking at. I am pretty excited for these cards as they allow for a lot of flexibility in the game in the upcoming meta. With the announcement of a rotation happening, many people looked towards the Chillwind Yeti or the Savage Combatant as a replacement for the Piloted Shredder. However, what’s better than a Chillwind Yeti? Well, a Chillwind Yeti with the chance of being a Twilight Drake. This definitely looks like an auto include for the four slot in Druid decks in the upcoming meta. This card can be compared a couple ways to some cards we have right now. For four mana we have Silvermoon Guardian which is a four drop with 3/3 stats and divine shield. 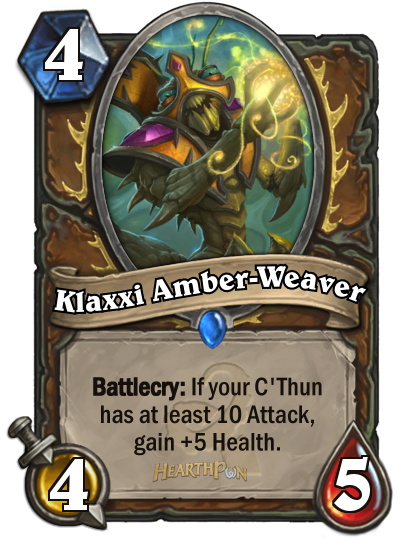 The 3 Attack isn’t very strong on a four drop, which makes the card underwhelming. Another card C’Thun’s Chosen is similar to is Piloted Shredder. A lot of the times Piloted Shredder will trade with a minion and drop a two cost minion. If you look at this card, it does something quite similar, it trades into something and breaks its Divine Shield, which then let’s it trade again with another minion – similar to it being a two drop coming from the Deathrattle of the Shredder. 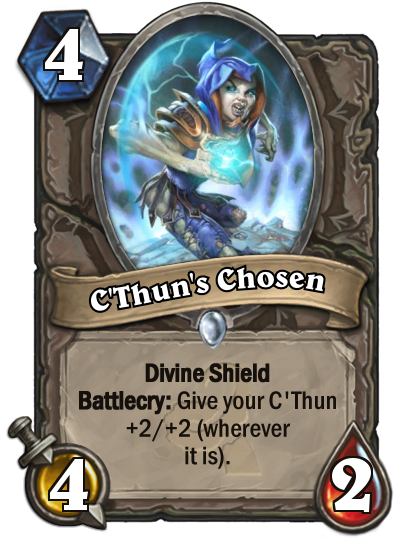 Along with it’s decent stats along with the Divine Shield, it buffs C’Thun. Text: Battlecry: If your C’Thun has at least 10 Attack, gain 10 Armor. This card is a seven drop that doesn’t die the current Big Game Hunter, which may eventually get changed to something else – but until then we will have to look at the card as we know it right now. I can see this card being used in a Control Warrior deck or a slow deck built around C’Thun. 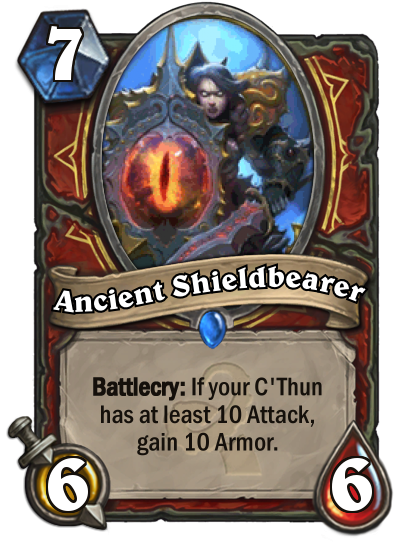 10 Attack on C’Thun isn’t too hard to achieve which makes the Battlecry pretty easily activated. It also has decent stats for a seven cost minion. Warriors tend to have a slow game plan anyways, which means it can probably wait until the Battlecry will give the player 10 armour. Text: Spend all your Mana. 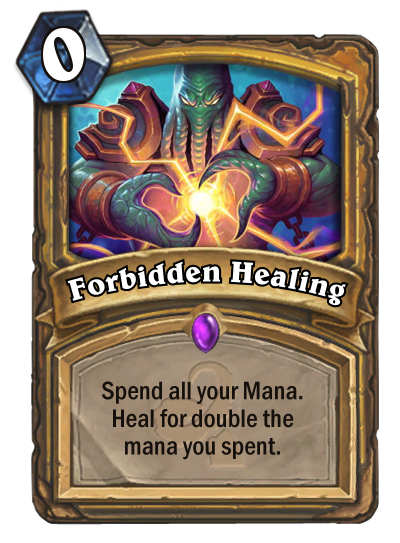 Heal for double the Mana you spent. With a lot of the anti aggro cards getting rotated out, I think this card will be pretty decent. If you compare the mana costs, when you use the card with low mana it might not seem that great and it seems extremely powerful at high mana costs. However, one thing you need to keep in mind is the flexibility the card has, you can use it when you float mana and know you won’t be able to cast it later on. You may also cast it when you have a lot of mana and play one or two costing cards. A lot of old Paladin before Naxx was based on healing, stalling and wiping the board. I think it may be possible to go back the old Paladin roots instead of what we are seeing today in the current meta. Text: Spend all your Mana. Summon a random minion that costs that much. 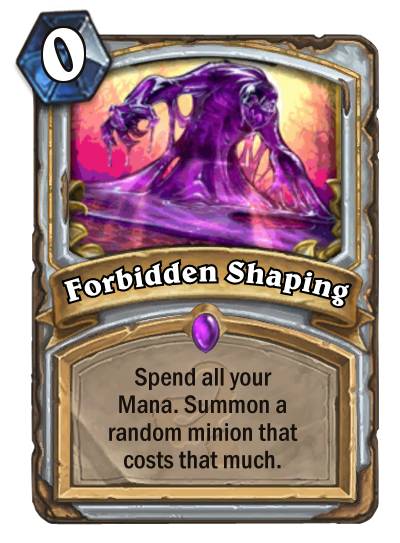 I am personally very excited for this card, the forbidden cards really allow for flexible playing as they are designed to do. You can play it for a low cost and play a cheap minion to control the board early on in the game against aggro decks. You can also play it late game as a bomb. A lot of the eight cost minions have really good effects that you can try to get and is also accessible by using your hero power first. The ten minions are minions with large stats like the giants and Deathwing. Text: Spend all your Mana. Deal that much damage to a minion. I think this card has a chance to be played purely due to its flexibility. I heard a lot of people mention how Flame Lance isn’t being played which is relatively cheap and can remove a lot of bombs in the game. However, the fact is that this card can be used in many different ways that allows it to be better than Flame Lance. 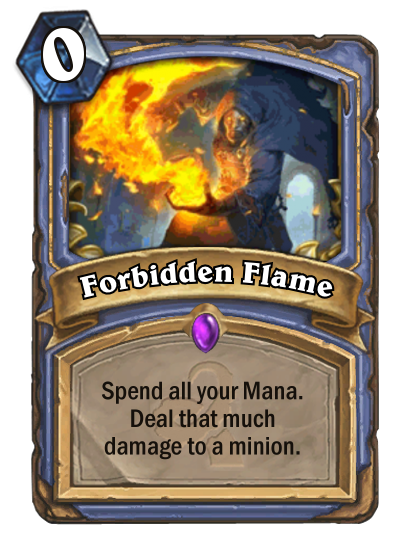 If you compare it to cards like Fireball it does seem pretty underwhelming, so it does seem a bit awkward to put in your deck but versatility is a strong characteristic of the card. The ability to only target minions makes the card slightly worse. Out of the three forbidden cards shown so far, it may see the least amount of play. In the next article we will be looking at the cards revealed on March 20th to 23rd.